Now that you have baba ghanoush, you need something to dip in it. Crudities are always good—and healthy, especially in the summer when there are grape tomatoes, cucumbers, celery, or even blanched green beans. 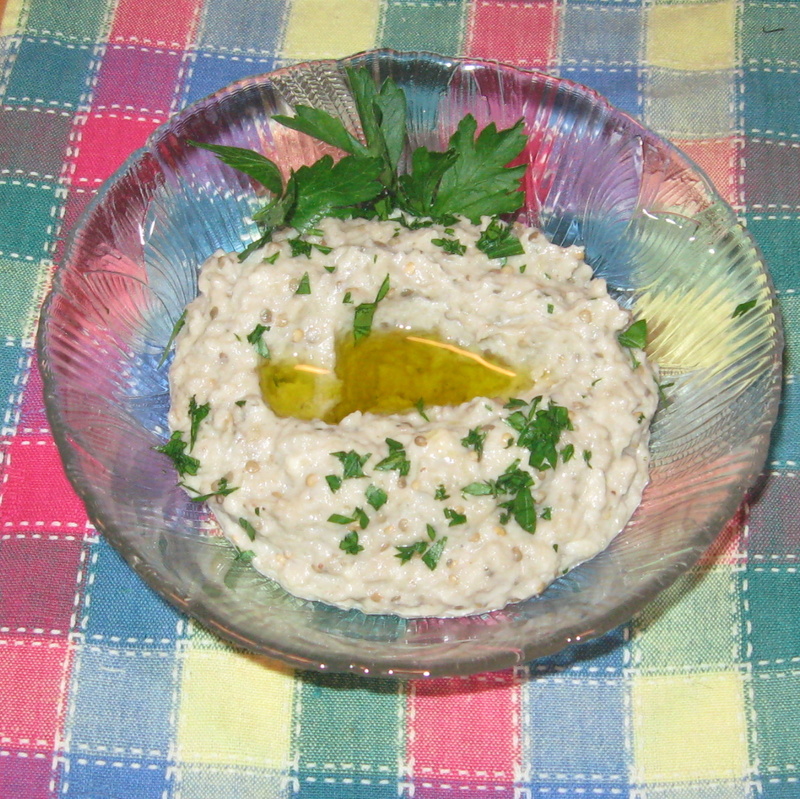 The traditional thing to have with baba ghanoush, however, is pita bread. 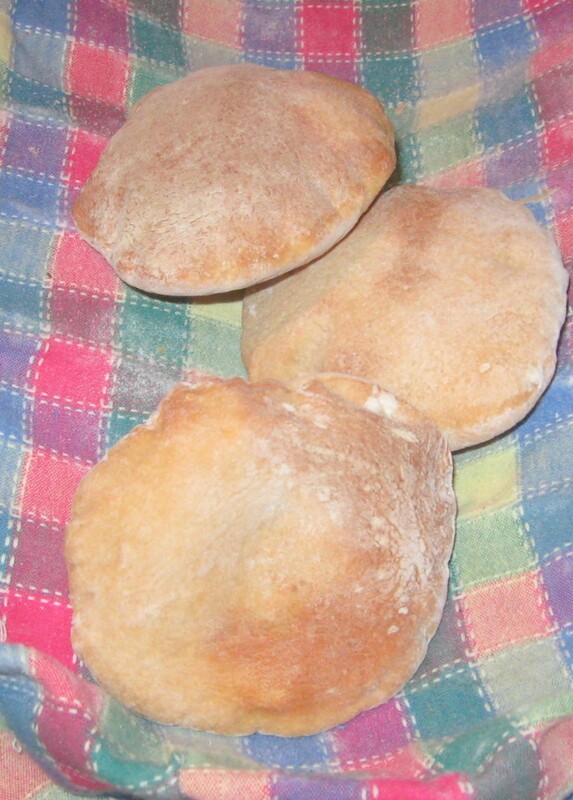 I’m sure that you can find pita at your market but it’s very easy to make and tastes so good freshly baked. I’ve posted about the no-knead bread dough that can be kept in the refrigerator for about two weeks. You can use that same dough to make flat breads (pita included), crackers, pizza crust, and the like as well. It’s just a matter of how you treat the dough. The same authors who did Artisan Bread in Five Minutes a Day now have another book out: Healthy Bread in Five Minutes a Day. This no-knead method is SO easy, and works so well for single-serving cooking that I had to try this one too. The master recipe in this is for a whole-wheat bread. That basic dough can be used for pita bread as well. That master recipe can be found on one of my favorite food-related blogs, Former Chef–so I’ll not reproduce it here. I’ve made this recipe using white whole wheat flour. I’ll admit that I’m partial to King Arthur flours; it’s available in my supermarket–so that is what I’ve used. To make pita bread you don’t need to let the dough rise before baking so it’s very quick. Just develop the gluten cloak in the usual way. Since I wanted to do smaller pitas, I used about 75 to 100 grams of dough for each portion, “cloaking” each small portion and flattening it, rolling it out to about 1/8 inch thickness. but the “pocket” is still there. Pitas made from whole-grain flours may not puff as much as if made from unbleached all-purpose white flour. Since these are not crusty, you can store in a plastic bag. Your write-up is truly informative. Much more than that, it? ?s engaging, compelling and well-written. I would desire to see even far more of these types of wonderful writing.